Cydney and her team are amazing! We seriously can’t thank them enough!! She provided great advice on all aspects of our wedding in order to save us money and to suit our needs! She was always available when we would call, email or text her with questions. My mom was a little concerned about certain things for the day of the wedding (guests getting out of hand, not getting our damage deposit back, etc), but Cydney made sure everything went smoothly! I highly recommend her and her team to plan your wedding, you won’t regret it! This is the second time I have used Stiletto Events. My first daughter was married in 2012, my second September 2015. If I had a third daughter, I would use them again. In planning the wedding, Cydney’s experience and vendor contacts helped us tremendously. She thought of things I wouldn’t have and she managed the contracts representing our best interests. The day of the wedding she handled all of the details so that I wouldn’t have to. Our wedding would not have been complete without Cydney & her Stiletto Events team! Being fairly new to Colorado, we not only needed a wedding planner, but also a friend & we found both in Cydney. From the big things like selecting a wedding photographer & band, to the little things like decor & unique ideas, Cydney was there for us every step of the way. I could go on & on, but I will leave you with this…our wedding aisle was a steep slope (a hike!) and I could not get down the aisle in my dress & heels, so guess what? Cydney was holding up my dress (while pregnant with twins!) and walked me down the aisle, squatting & secretly, so I could still have my moment & not fall on my face! I HIGHLY recommend Cydney & Stiletto Events for your special day. I assure you they will get to know you, they will make it extra special, they will make it YOUR day & ensure it is full of love. Oh my goodness! We still cannot believe how absolutely perfect our wedding day was and still get compliments from our guests about the details, beauty, and smoothness of the whole day. We can’t thank Cydney enough for everything she did to help make our day so magical. From our very first meeting I felt a huge relief and immediately became confident that my vision for my wedding would come true, if not better than imagined. Every time I had a question, concern, or moment of panic Cydney was always so quick to respond and very reassuring! My husband and I both agree that the best money we spent on our entire wedding was to have Cydney and her team included throughout the whole planning process and especially our wedding day. We never had any doubts that everything wouldn’t be handled perfectly. I felt like Cydney was personally by my husband’s and my side every step of the day. Some of the best conversations I remember from my wedding day were with her, as she was always so calm, reassuring, and sweet! Cydney paid particular attention to the little details that she knew were important to us and went above and beyond to make the day just as we had envisioned it. I can’t say enough good things about Cydney and her team at Stiletto Events – they truly were phenomenal! I just wanted to thank all of you for the absolutely fabulous wedding on Sunday. Everything went so smoothly (even the weather) and the venue and the food and flowers were spectacular! Cydney, the best thing I ever did was hire you. You and your staff were so professional and made sure everything went smoothly and the same goes for the catering and venue staff. The flowers were incredible and everyone was commenting on how gorgeous the chuppah was. Thank you all for making Mary and Matthew’s wedding day perfect. They told me it was absolutely the party and day that they wanted. OMG Cydney was a life saver during our wedding!! We had a couple of hiccups that Cydney took care of and she took great care to not stress me out about them! She ways always on top of things throughout the WHOLE day/night and I really don’t know how we would have done it without her. Her and her team were fantastic and always one step ahead. 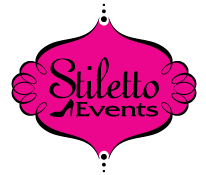 Cydney and her staff at Stiletto Events went above and beyond our expectations. We would have been a complete disaster the day of the wedding without their help. Any little problem that popped up was handled quickly and promplety. Our venue didn’t order our wine and Cydney noticed right away and took care of it. Without her we would have not noticed until the reception started. I’ve already given Cydney’s information out to a couple of different friends who are about to get married and I will continue to do so. I knew that I found the right wedding planner for me when I received a return email from Cydney at Stiletto Events within 5 minutes of my original inquiry. My husband and I had only one date that would work for a wedding this year, and of course if fell on a Saturday in peak wedding season. As much research and “envisioning” as I had done, I still was panicked about finding the right venue and vendors for my dream wedding. This is where Cydney stepped in. I met her for the first time to do a consultation and hired her on the spot. Within 10 minutes, we were on the phone calling over 40 venues to check availability. We also immediately booked an incredible team of vendors (Cydney-approved vendors, of course!) Before I knew it, my wedding was fully planned, right down to the tiny details (beautiful paper flowers hand-made by her team, personalized thank-you notes for each place setting, adorable programs for guests). Cydney has a no-nonsense attitude that works perfectly for getting done what needs to be done. Her brides, grooms, and families are ALWAYS put first, even if it means sacrificing her dinner time to make phone calls or answer my constant text messages. She is original, creative, and incredibly artistic. Her ability to envision exactly what her brides want is uncanny…most of the time, she knew what I wanted before I even told her! One of my many favorite things about Stiletto Events is that I could be as involved or uninvolved in the entire planning process as I wanted. Once I started graduate school a few months before the wedding, Cydney was fully entrusted to complete whatever tasks were needed. My wedding day went off PERFECTLY, and the most priceless aspect was that my family, husband, and I did not have to worry about one single thing…Cydney and her team are a seamless, well-oiled machine that produce beautiful events within your budget. I trusted her with the biggest day of my life, and I would do it all over again if I had the chance! There are not enough words to describe the amazing work Cydney did for my wedding, from the centerpieces to the detailed napkins, she nailed it all. She made the day run smoothly and if anything went wrong, I didn’t know about it! I never imagined my wedding day to be what it was and thanks to Cydney, it was. She is hard working, detail oriented and will always go the extra mile to make sure your day is special. I thought I was the most detail oriented person, until I met her. She had made my dream wedding into a reality and I couldn’t have done it without her! Hands down best wedding planner out there! Coming from a Groom’s perspective, Cydney went over and above to make sure my bride was calm and taken care of the day of. She helped her with projects and did a lot of the extra details. She really went the extra mile to make sure me and my wife could have a wonderful stress free day. Thank you, Cydney. Cydney was AWESOME!!! She was my “Day Of Coordinator” at Stonebrook Manor in Thornton, CO. Stonebrook made a lot of promises to get my deposit; however, 1-2 months prior to the wedding, Stonebrook indicated that I would need to pay extra for items that you would assume to be included in set up of the reception (centerpieces on the tables, for example). Stonebrook also completely changed the menu selection & made attempts to take advantage financially, but Cydney protected my interests 100%. On the day of the reception, she made absolutely certain everything was set up the way I wanted it & that everything went smoothly from start to finish. My wedding day could not have been a success without Cydney’s help. It was completely stress free for me & that’s the way every bride should feel on her big day. I HIGHLY recommend Cydney!